Intel is planning to launch a 3D printed robot later this year. The designs for the hardware will be made available online free of charge although interested buyers will need to shell out around $1,600 to purchase the remaining kit which includes things like motors, batteries, wiring, the processor and more. The chipmaker was able to keep the cost down (if you consider $1,600 cheap) for the consumer model due to the fact that it’ll be powered by Edison, Intel’s tiny circuit board that essentially crams a full Pentium class PC onto a device the size of an SD card. The research version features an i5 processor that costs closer to $16,000. Intel tells us the robot will be open-source which will let developers build their own programs and apps for it. The hope is that a community of developers will help enhance the robot’s capabilities over time but even from the get-go, it’ll be pretty versatile. 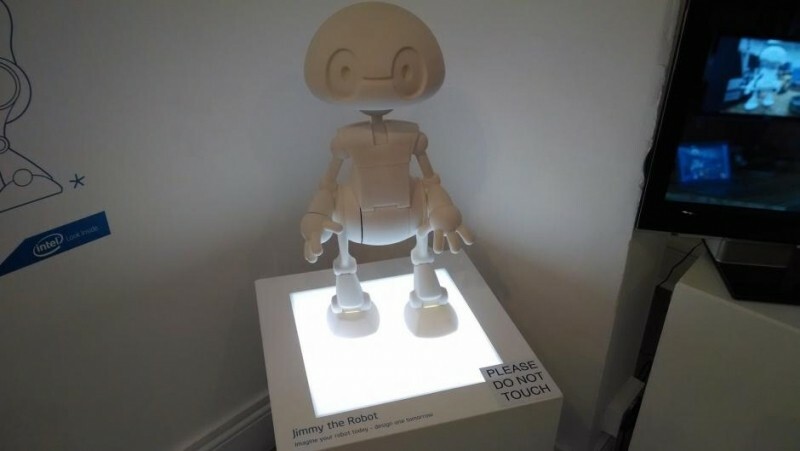 A demo version of the robot named Jimmy was on display at the Code Conference. The humanoid was able to walk, talk, dance and yes, even tweet (@21crobot). His dance skills weren’t too terribly impressive, however, as Intel’s Brian David Johnson said he obviously was taught to dance by geeks. Intel’s robots will be able to accomplish other tasks as well such as singing along with a user, translating languages and even delivering a cold beer to its owner. Johnson said the main goal of the project is to lower the barrier of entry to robotics. The kit will be sold through 21stCenturyRobot.com later this year.